I like to switch to Double on stages with ceilings, though I seem to do better with the Laser on stage six. Double is a MUST for the final stage! Yeah, I really think Double is necessary for some areas, though I'm finding that I can get through the Moai stage, particularly in the arcade ports, quite well with the laser and a couple options. This might be because of the hitbox. I don't know if it's strictly the PSP port, or if other arcade ports follow suit (i.e. Gradius Deluxe Pack, PS4 Arcade Archives), but it seems like the hit detection is much more forgiving in those versions. 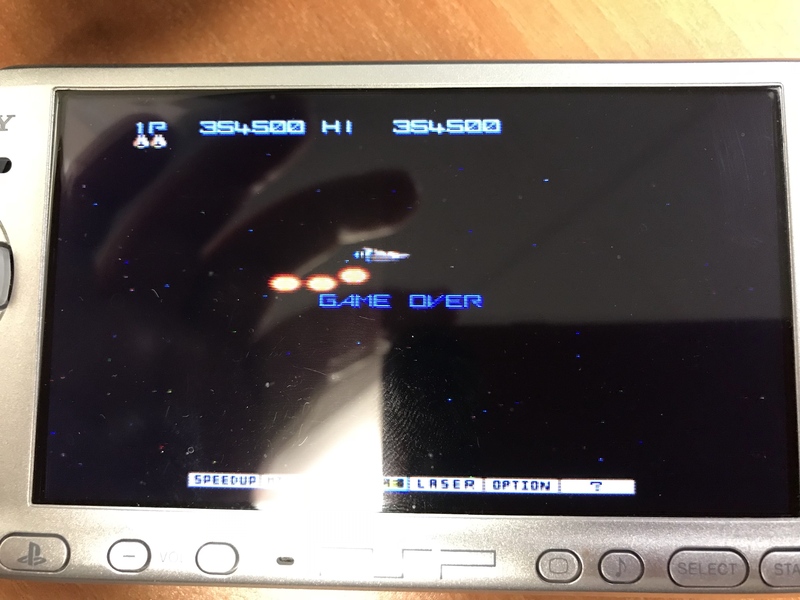 I found myself cringing because I thought I was going to die several times through the course of Stages 4-6 in playing on PSP over lunch at work just now, but I found that bullets and enemies can lightly graze the Vic Viper a bit, depending on the proximity, whereas on the NES version, if it's a pixel of overlap, you're done dealing. Considering I hadn't managed to make it past Stage 4 prior to this, save for one time, I was pretty pleased with this last run. I neglected to switch to Double, however, and I think that was my downfall. Assuming I make it this far again, I'll have to give that a whirl. IIRC, you're right about the hitbox. I've definitely singed Vic's nose more than a few times. Just to be sure, though, see if the hit size is set to normal in the options (ha). I think the PSP port deviously defaults that to small. From my experience in MAME, the normal hit size is arcade-accurate. Regarding practice: drilling specific parts definitely helped me. At first I would memorize paths, then come to a more general feel of how enemies behaved. But the thing that improved my performance most was putting in three speed-ups. In the abstract, it makes sense, because speed-ups come without rank. For no extra charge, you can improve your speed, and enemy bullets won't get any faster. This opens up tons of opportunities and makes the game lean more on your reflexes and less on your knowledge--you can zoom around bullets that used to chase you. It was rough at first, but after a few days' practice, I got used to it. And once you get used to it, this new skill is applicable to every stage in the game, not just to one particular setup. I went ahead and put the full replay of my NES run on page 3! -In the arcade version, laser has a hilarious hitbox. -In stage 5, you can hit the brain monsters' elbow joints to kill their arms. Double can be helpful for pinpoint strikes. When I begin my power-up cycle, I always start with 2 speed-ups. 2 feels reasonably good at first, and then a third later (after getting some firepower) is now my go-to. I used to only do a single speed-up, and I don't know why, but unless you have absolutely Jedi-level reflexes, and can predict what bullets will be coming and from where, a minimum of 2 speed-ups is probably a must. Regarding the hitbox of the laser, I have noticed that sometimes it doesn't seem to destroy stuff upon impact, but only after a portion of it passes through the object. I wonder if this was to compensate for the fact that the lasers follow your ship and/or option movement until fully fired, at which point they simply move forward. It would make sense, because, if you made it so that instant contact with the laser would damage or destroy most enemies, a 360 degree roll pattern through open areas of the stage would be plenty enough to ward off most anything, and there'd be little challenge until the stage boxed you in somewhat with landscape and obstacles. Even then, you'd have more of an advantage. The brain monsters are interesting beasts. In the NES version, either with lasers or standard bullets (not Double), you can destroy them fairly easily with enough shots (or turbo). In the arcade version, you really have to concentrate fire, and even then, sometimes all you can hope for is taking out the arms. It's an odd thing. I also noticed that lasers are far more effective on the metal ball enemies (that spit out smaller metal projectiles at you) in the arcade than NES version. Perhaps this is just the nature of the game's layout, sprite size, and rate of fire, but in the NES version, lasers have zero chance to pass through the projectiles. In the arcade version, because the lasers are longer and thinner, they seem to be a bit less prone to get blocked. I wanted to give a few tips on scoring that I've picked up. Any area where you can destroy projectiles is a place to milk a lot of points. The best examples are the volcanoes, and also the Moai ring lasers. In both instances, each volcanic rock or ring projectile grants points upon destruction, so powering up to the point where you can take out a lot of them can really help ramp up your score. For example, in the first stage, if you can get 2 options, lasers, and missiles, prior to reaching the volcanoes, then position your ship just right, you can take out the vast majority of the volcanic rocks, and get your score into the 70K range, which works in both the NES and arcade versions. In the Moai stage, while I haven't calculated it, because I'm too busy dodging and taking out rings, if you can fly through areas with Moai that attack you from above and below, you'll trigger more rings, which means more point milking. The same thing goes for the Stage 6 boss, which fires projectiles at you. In the NES version, you get an extra life every 100,000 points, so my earlier score of over 500,000 on the NES version meant that I had earned 5 extra lives. True, once you die, it's difficult to recover, and you may end up burning through those quickly, but more chances means more opportunities to learn the stage, and try to learn how to recover. I've been busy editing videos lately, so I haven't had time to practice since last week. I streamed a run where I didn't die until stage two of the 2nd loop, and then I just quit, cuz there was no way I was gonna beat my previous top score (NES version). We have till the end of the month to keep trying, right? Yes, Gradius is the game for all of July, so don't feel like you have to make your best score or play all at once. I'm spreading my play out between multiple versions, and I'm also participating in the DOOM play through, so I put time into Gradius when it makes sense. The volcano milking is so tricky. I've never gotten the hang of the correct placement! Maybe now's the time to sit down and practice it. Regarding the Moai milking, I never thought those 100 points-per-ring would add up. I'd like to put some time into practicing that, too. 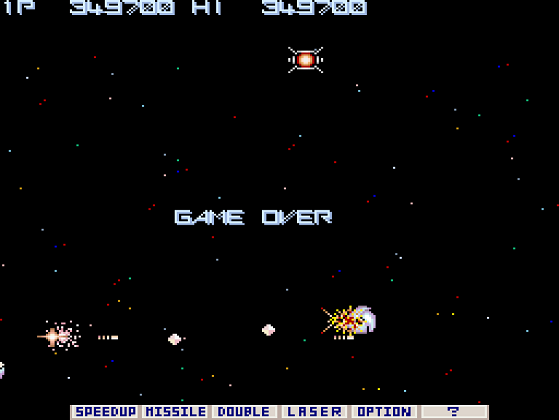 Took me about a week of practice, but I've gotten back to a 1CC of Gradius arcade. I made it up to 349,700. Also a pretty good demo of how overly huge the hitbox on the laser is. Congrats on the 1CC. I don't think there is any shooter that I have gotten that good at. Congrats, Golem! I’m assuming, based on your score, that your 1CC is for only the first loop? Either way, impressive! Do you guys consider 1CC a no-death run? To me, one credit clear means finishing the game within one credit or set of lives. Either way, congrats, Golem! Finishing Gradius is a great feeling! A 1CC is finishing the game on a single credit, whether that's the 3 requisite lives you start with, or 12, if you get that many extends via scoring or drops, during the course of the game. As long as the gameplay is contiguous, with no continues, and a constant score during that period of time, it's a 1CC. A no-death run is far more impressive. I nearly did that with Dragon Spirit on the NES - I think I died once or twice when I did that a few years ago. Yeah, only the one loop. :b I'm still coming in under your 1-7 score! Unlike the NES version, the second loop of the arcade Gradius is a merciless leap in difficulty. I think my strategy going forward will be to master using the laser in loop 1 and see if that works any better on loop 2. I prefer the double in Gradius because you can get up close to enemies and take them out quickly. The trouble with that on loop 2 is that getting close to enemies puts you closer to suicide bullets. OK, that's what I thought. I hear so many people refer to a 1CC as a no-death run. And this is precisely why I'm more of a survival play than a score player, at least with regard to classic shooters. I try to always err on the side of caution, knowing that death is around every corner, or at the edge of every enemy bullet. If I ever truly mastered a game, where I knew the mechanics and patterns well enough to know what the full risk assessment was for that kind of strategy, I might adopt it, to try to achieve a higher score, but I've never spent enough time with any one game to ever get to that point.